Small group so easy to get to know people. Crew were great and made sure we were well briefed and looked after. Stop for bbq lunch and swim in the Harbour just topped things off. Thoroughly recommend this tour if you want a personal and more intimate tour of Sydney Harbour. I wouldn't call this a luxury cruise. The boat was comfortable and the food OK. The first mate tried to serve the guests food and drink and narrate the tour. There should have been someone there to serve as hostess. Fantastic tour. Great crew, the food was delicious, and we had just enough time in the bay to relax. HIGHLY recommended. A superb day out. The vessel was designed for a maximum of 14 passengers. We had ten and it was ideal. Our captain was brisk and efficient. There was an onboard guide whose commentary was interesting and amusing.The trip included lunch -prawns for entree, salmon and beef for the main course. Wine and beer was freely available. The trip ticks all the boxes for a good day out. 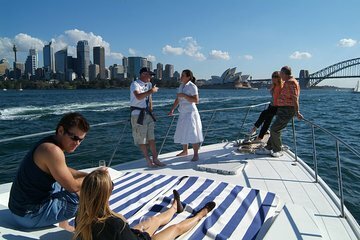 This was a special way to see the Sydney Harbor and all of its bays and sights along the water. Shane and Howard did a very nice job of telling us about the area, navigating the cabin cruiser, preparing our meal and anything else that needed taking care of. The weather did include a few rain showers, but that did not ruin the day for me. It is advertised that there is time to swim, fish and kayak, but the reality is that they are so busy taking care of lunch and other items, there really isn't the help needed to make that happen. Since I was not planning to do anything but enjoy the sights this did not impact my good time. I would suggest they add another crew member for these activities. My husband and I did this cruise in Apr 16 and had a great time. Can't beat the views from the water and it was very relaxing to have such a small group. Crew was great and the food was delicious. Would highly recommend. A most enjoyable trip. Many thanks and keep up the good work! Great tour. Shane and Tracy were wonderful. It was informative and the cove we set into stunning. Shane did a great grilling job besides captaining the boat. Ample food and wine. We happened to go on a blisteringly hot day in Sydney but it was cool and lovely on the boat. Would highly recommend it and take it again. A very worthwhile trip with knowledgeable guide. Plenty of free flowing drink, but food fairly basic as it was described as a BBQ, but really a cold buffet. Great views around the harbour and would have preferred a little more touring than a lengthy lunch stop albeit at a very picturesque location. Convenient pick up and drop off location in Circular Quay and close too The Rocks. Overall 4, so I would recommend.